These wheeled acrylic brochure racks are made of lightweight plastic and equipped with 4 casters on the base to be easily moved around within an office or booth. 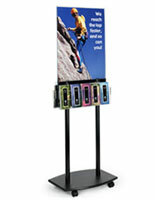 The literature display is a double sided stand that has pamphlets and poster views on each side. 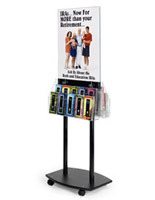 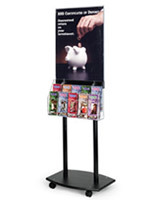 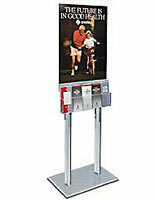 The brochure rack with 22” x 28” graphics holder measures 67” tall for a good viewing height. 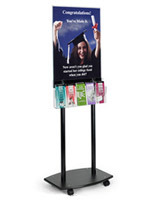 The plastic literature display is easy to put together and comes with all of the necessary hardware for doing so. 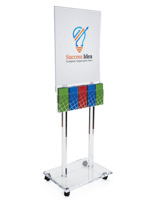 The rack features 10 pockets on each side that have removable pegs to accommodate both 4” and 8.5” wide materials. 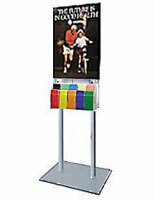 The poster holder is mobile, but features locking wheels so that it will stay in place when needed.